The company "GIORD" was established in August 1993. For many years of work the company has become one of the leaders in the market of food ingredients. The company "GIORD" is interested in new partners, always open to new ideas, innovations and for long-term partnership. "GIORD" is engaged in food additives production and distribution for various sectors of the food industry. Food colors with individual color selection. Through the use of which you can get any color for different products (ice cream, confectionery, beverages, meat and dairy products, etc. ): chocolate, apple, apricot, orange, cherry, green pea, caviar, pomegranate, coffee, etc. Complex food additives series STABILAN (thickener, stabilizer, emulsifier) for ice cream, mayonnaise, ketchup, dairy and meat products, confectionery products, caviar, beverages, sauces, bakery foods, pasta, etc. And STABILAN FLAU for bakery foods shelf life increasing. Intensive sweeteners of the SLAD product line. The company's products have earned recognition not only among consumers. 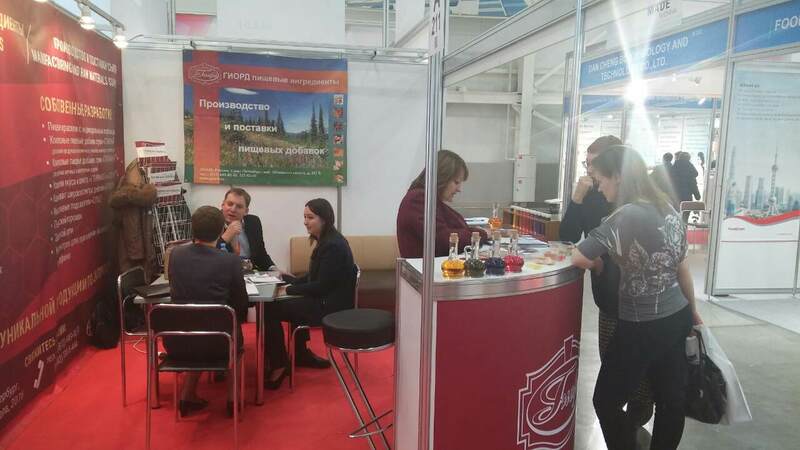 Accordingly to the results of the 7th International Specialized Exhibition "INTERFOOD / INGREDIENTS 2003", "GIORD" became a laureate of the contest "Golden Ingredient" for the development of the flavor and aroma enhancer Glurinat. In 2017, the "GIORD" company won the competition "Best Product - 2017" and received a gold medal for the "VALERI-MIX" premix. 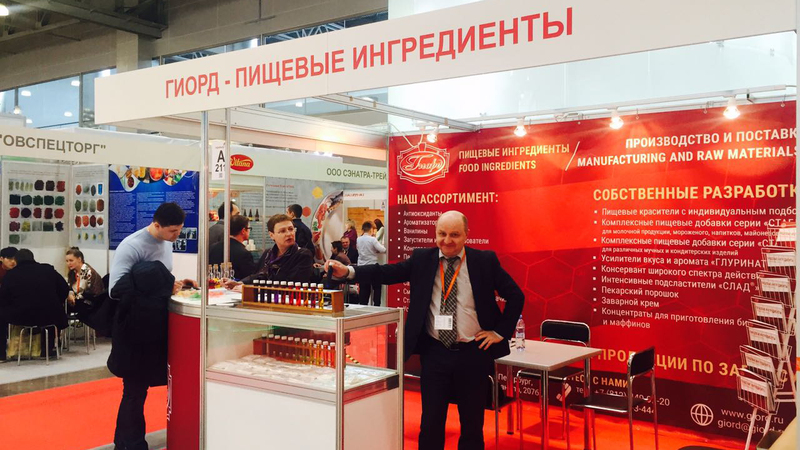 The company "GIORD" constantly takes part in the largest specialized exhibitions: in 2015 the company took part in the 18th exhibition "PIR", and in 2017 - in the 20th international exhibition of food ingredients "Ingredients Russia 2017". Great experience in working with companies from many regions of the world has taught us to take into account characteristics of different markets and to find common language with partners. We offer a wide range of products at best prices, with flexible terms of delivery. It is convenient to work with us for companies of any specialization, of any size, from any region of Russia and CIS countries. Since 1993, "GIORD" has won the trust of more than 5,000 customers, including both private entrepreneurs and large holdings. To optimize work with the regions, "GIORD" has developed dealer network. Well-organized work scheme allows us to provide a wide range of high-quality products, ensure uninterrupted supply of food additives, full service and strict fulfillment of contracts. Technology support service has been created to support customers. Highly qualified technologists will answer your questions regarding the use of food additives. 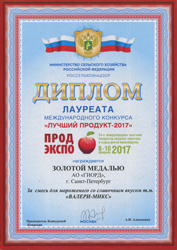 The company is one of the founders and permanent members of the Russian Union of Manufacturers of Food Ingredients (SPPI). Quality control service monitors that all of our products meet the requirements of the standards and is accompanied by quality certificates of Rosstandart and other necessary documents. Technological Department is engaged in the development of recipes, production technologies and food additives usage, and also provides theoretical and practical assistance to our clients in the proper application of the products. 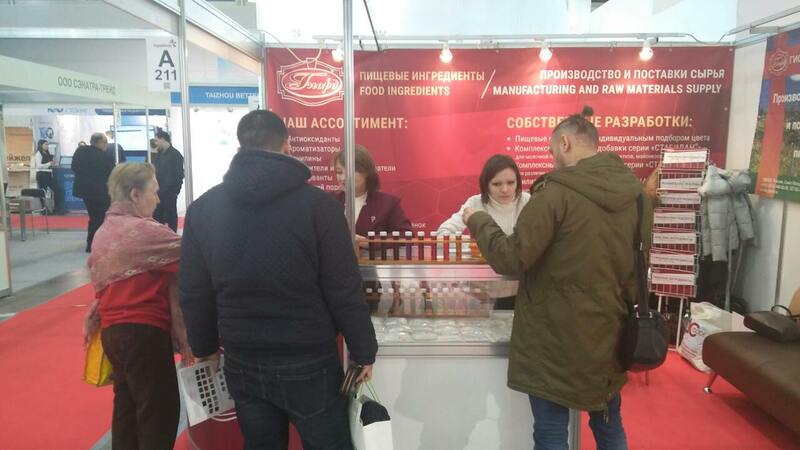 Food laboratory employees of technological department study novelties of the market, work out technological modes of application and dosage of additives in the production of specific food products. This makes it possible to develop individual recipes for customers and to issue technical documentation for them. Sales department. Our managers perfectly familiarized with the market and offer customers the most optimal options for supply. Logistics department, which provides delivery of products to customers in any region of the Russian Federation and the CIS countries with minimum deadlines. The company also includes a publishing house for the production of educational, technical and scientific literature for food industry professionals.